Strain CDC 945T (= ATCC BAA-974T = CIP 10838T = DSM 45345 = CCUG 50838T = JCM 13579T) is the type strain of the species Segniliparus rugosus in the Segniliparaceae family . The genus name was created to acknowledge the presence of novel long carbon-chain fatty acids (mycolic acids) detected using the Mycobacterium species identification method with high performance liquid chromatography (HPLC) . The name was formed from the Latin adjective ‘segnis’, meaning ‘slow’ and combined with the Greek adjective ‘liparos’ for ‘fatty’, to indicate the ‘one with slow fats’. The name relates to the late elution of the apolar, alpha-mycolic acids (fatty acids) during HPLC analysis . The specific epithet for the taxon name is from the Latin adjective ‘rugosus’, referring to the formation of wrinkled, rough colony morphology . The type strain of S. rugosus, CDC 945T, was isolated from a human sputum specimen collected in Alabama, USA . S. rugosus has been isolated from multiple patients with cystic fibrosis in the U.S. and Australia and appears to be a respiratory opportunistic pathogen [3,4]. A recent isolation from a ~1 year old sea lion showing third-stage malnutrition with a 30% loss of body weight, moderate bradycardia and severe hypothermia, suggests a possible aquatic or marine niche for the species . The only other validly named species of the genus is Segniliparus rotundus (CDC 1076T), which is the type strain of this species. S. rotundus. CDC 1076 shares 98.9% 16S rRNA sequence identity with S. rugosus CDC 945T, although the DNA-DNA hybridization is less than 28% . 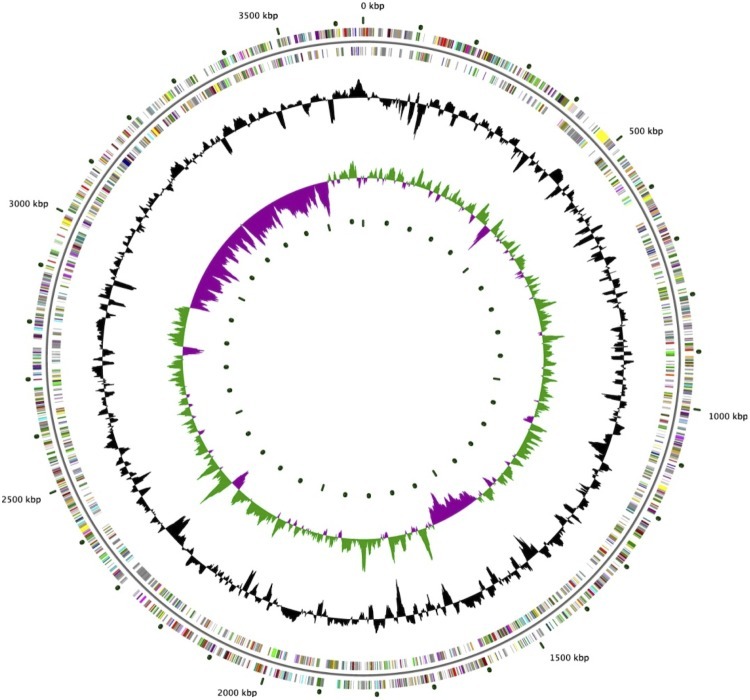 The complete genome of S. rotundus was recently reported and has 3,157,527 bp with 3,081 protein-coding and 52 RNA genes . Here we present a summary classification and a set of features for S. rugosus CDC 945T, together with the description of the high quality draft genomic sequencing and annotation. The cells of CDC 945T are irregular rods ranging in length and width from 0.55-0.90 µm by 1.9-4.5 µm (Table 1 and Figure 1). Colonies are wrinkled, rough and form in less than 7 days on 7H10 and 7H11 agar at an optimal temperature of 33oC . CDC 945T is aerobic, non-motile, asporogenous, and stains bright red with acid alcohol stain . It is mesophilic and demonstrates a temperature range for growth between 22 and 42 oC . Colonies grown for < 4 weeks are non-pigmented, nonphotochromogenic and do not produce a diagnostic odor . They do not produce aerial mycelium, spores or demonstrate true branching. Young colonies are creamy and smear easily when disturbed. Cell growth at ~4 weeks on Löwenstein-Jensen (LJ) medium produces a diffusible pink color in the agar at the leading edges of mature growth. Aged colonies on LJ develop a light buff pigment and demonstrate ‘greening’ from uptake of malachite green . CDC 945T is weakly positive for arylsulfatase at 7 days but is strongly positive in 14 days. No growth on MacConkey agar not containing crystal violet. CDC 945T grows in the presence of 5% sodium chloride at 7 days, in lysozyme at 21 days. Positive for iron uptake, nitrate reduction, tellurite reduction and tween opacity. Negative for tween hydrolysis . Classification and general features of S. rugosus CDC 945T according to the MIGS recommendations . Evidence codes- TAS: Traceable Author Statement (i.e., a direct report exists in the literature); NAS Non-traceable Author Statement (i.e., not directly observed for the living, isolated sample, but based on a generally accepted property for the species, or anecdotal evidence). These evidence codes are from the Gene Ontology project . Scanning electron micrograph of S. rugosus CDC 945T. The scale bar is 667nm. Results with the API CORYNE test kit shows CDC 945T is positive for β-glucosidase, and pyrazinamidase activities and negative for alkaline phosphatase, β-galactosidase, β-glucuronidase, α-glucosidase, N-acetyl-β-glucosaminidase and pyrrolidonyl arylamidase activity at 33oC . It is susceptible to imipenem 4ug/ml, moxifloxacin 0.5 μg/ml, and trimethoprim-sulfamethoxazole < 4.8 ug/ml, intermediate to cefoxitan 64 ug/ml and resistant to amikacin >128 ug/ml, clarithromycin 32 ug/ml, ciprofloxacin 16 ug/ml, ethambutol >16 ug/ml and tobramycin >64 ug/ml. [1,3]. Strain CDC 945T uses D-glucose, glycerol, maltose, mannitol, D-sorbitol and trehalose as sole carbon sources with the production of acid. No growth on adonitol, L-arabinose, cellobiose, citrate, dulcitol, i-erythriol, galactose, i-myo-inositol, lactose, mannose, melibiose, raffinose, L-rhamnose, salicin or sodium citrate . The strain hydrolyzes urea but not acetamide adenine, casein, aesculin, hypoxanthine, tyrosine or xanthine . The cell wall of strain CDC 945T contains mycolic acids and meso-diaminopimelic acid . The mycolic acid pattern developed with HPLC is a double cluster of peaks emerging at 7.24 min and the last peak group is unresolved and elutes slightly before the 110 carbon chain length, high molecular weight internal standard [1,2]. Thin layer chromatography confirms 2 groups of apolar, α- and α'-alpha-mycolic acids lacking oxygen function, other than the hydroxyl group . The HPLC and TLC results indicate that this strain produces a unique homologous subclass of long, alpha-mycolic acids with additional 90 to 110 carbons . The fatty acid profile by gas-liquid chromatography is C10:0 (8.65%), C12:0 (1.33%), C14:0 (8.49%), C16:0 (18.34%), C18:1ω9c (8.93%), C18:0 10-methyl (tuberculostearic acid, 21.62%), and C20 (28.51%) . The phylogenetic association of Segniliparus species is shown in Figure 2 in a 16S rRNA based tree. The genus forms a distinct lineage relative to the other mycolic acid containing Actinobacteria. The positioning of Segniliparus in this phylogenetic analysis is consistent with its positioning in the “All-Species Living Tree Project” LTP release 106, August 2011, which is similarly based on 16S rRNA. . 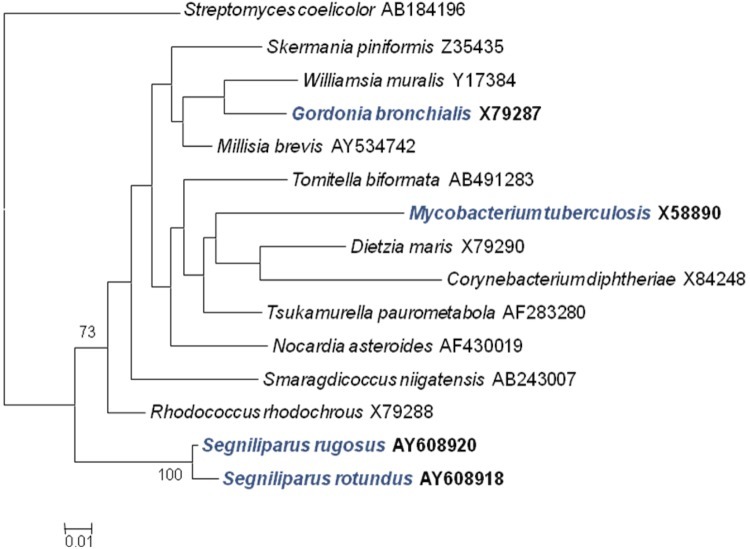 Maximum likelihood phylogenetic tree was generated using PHYML v2.2.4  based on 16S rRNA sequences highlighting the position of S. rugosus CDC 945T relative to the other type strains of mycolic acid containing genera in the suborder Corynebacterineae. GenBank accession numbers are listed after the name. The tree was inferred from 1,468 bp positions aligned using Clustal W  in MEGA v4 . Numbers at the branch nodes are support values from 1,000 bootstrap replicates if equal to or greater than 70%. The scale bar indicates substitutions per site. The tree was rooted with Streptomyces coelicolor. Lineages with type strain genome sequencing projects registered in GOLD  are shown in blue, published genomes in bold. 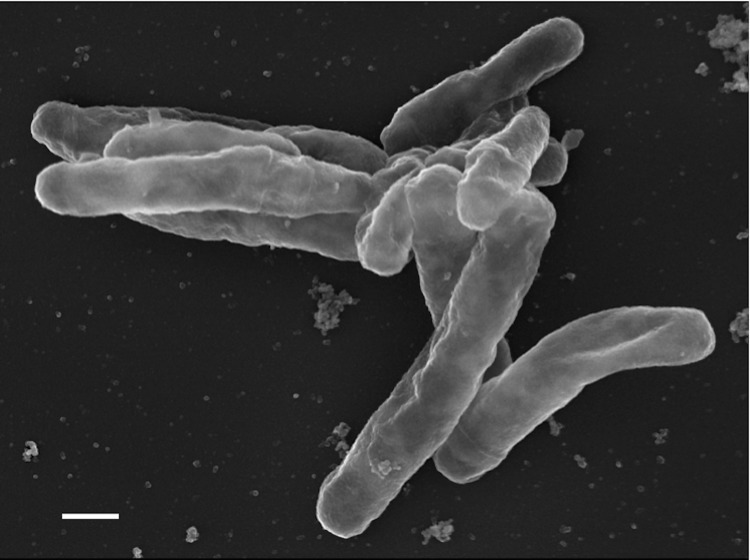 This organism was selected for sequencing on the basis of its association with respiratory lung disease and is part of the NIH Roadmap for Medical Research, Human Microbiome Project (HMP) . The HMP presents reference genomes in Genome Online Database (GOLD) , the Human Microbiome Project Data Analysis and Coordination Center Project Catalog  and the complete high quality draft genome sequence is deposited in GenBank . The Broad Institute performed the sequencing and annotation of this high quality draft genome . A summary of the project is given in Table 2. Strain CDC 945T was grown statically in Middlebrook 7H9 medium at 33oC until late log. DNA was isolated from whole cells after a chloroform/methanol wash with a disruption solution of guanidine thiocyamate, sarkosyl and mercaptoethanol as described in Mve-Obiang et al. . The purity of DNA was assessed by The Broad Institute using the Quant-iT™ dsDNA Assay High Sensitivity Kit (Invitrogen, Carlsbad, CA) and according to the manufacturer's protocol. Protein-coding genes were predicted using four ORF-finding tools: GeneMark , Glimmer3 , Metagene , and findBlastOrfs (unpublished). This latter tool builds genes by extending whole-genome blast alignments, in-frame, to include start and stop codons. The final set of non-overlapping ORFs was selected from the output of these tools using an in-house gene-caller, which uses dynamic programming to score candidate gene models based on strength of similarity to entries in UniRef90, then selects non-overlapping genes that, combined, have the highest overall score. In cases where predictions overlapped non-coding RNA features (see below), the genes were manually inspected and removed when necessary. Finally, the gene set was reviewed using both the NCBI discrepancy report and the internal Broad annotation metrics. Ribosomal RNAs (rRNAs) were identified with RNAmmer . The tRNA features were identified using tRNAScan . Other non-coding features were identified with RFAM . The gene product names were assigned based on Hmmer equivalogs from TIGRfam and Pfam, and blast hits to KEGG and SwissProt protein sequence databases. This was done using the naming tool “Pidgin” . This 3,567,567 bp draft genome has high G+C content (Table 3 and Figure 3) and is predicted to encode 3,571 genes, 98% of which are protein coding. Nearly 70% of predicted proteins have a functional prediction and COG functional categories have been assigned to 53% of predicted proteins (Table 4). Graphical circular map of the genome. From outside to the center: Genes on forward strand (color by COG categories), Genes on reverse strand (color by COG categories), GC content, GC skew. The authors gratefully acknowledge the Broad Genome Sequencing Platform, Lucia Alvarado-Balderrama for data submission and Susanna G. Hamilton for project management. We also acknowledge NIH for funding this project with grants to the Broad Institute (grants HHSN272200900017C and U54-HG004969). Liolios K, Chen IM, Mavromatis K, Tavernarakis N, Hugenholtz P, Markowitz VM, Kyrpides NC. The Genomes On Line Database (GOLD) in 2009: status of genomic and metagenomic projects and their associated metadata. Nucleic Acids Res 2010; 38:D346-3D354. Garrity GM, Holt JG. The Road Map to the Manual. In Garrity GM, Boone DR, Castenholz, RW. (eds). Bergey's Manual of Systematic Bacteriology, Second edition. New York: Springer; 2001. p119 -169.